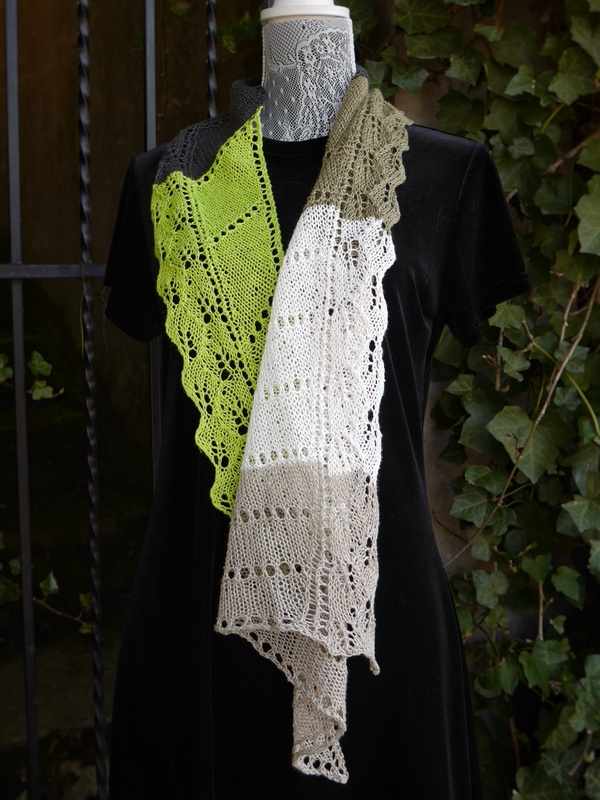 Linden Leaf is a summery accessory knit in sport weight linen. 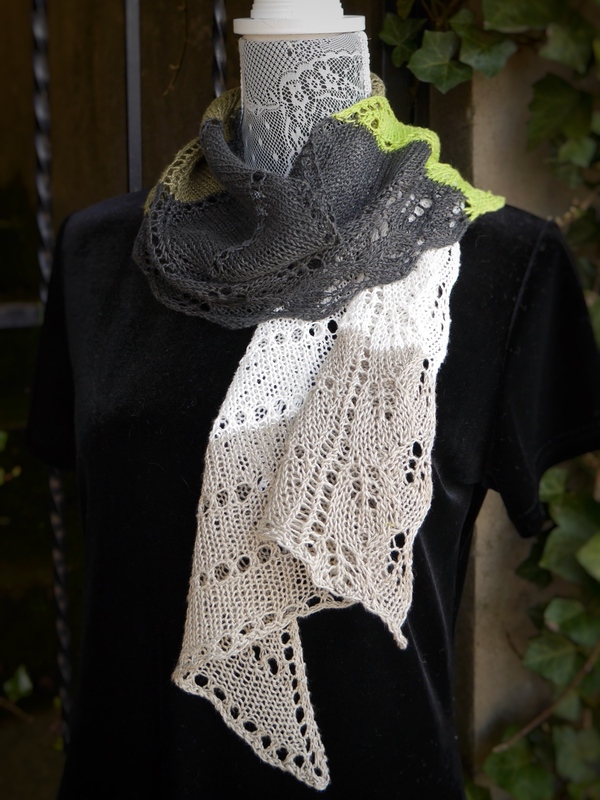 Something between a scarf and a shawlette, it’s a welcome way to dress up your spring/summer wardrobe. 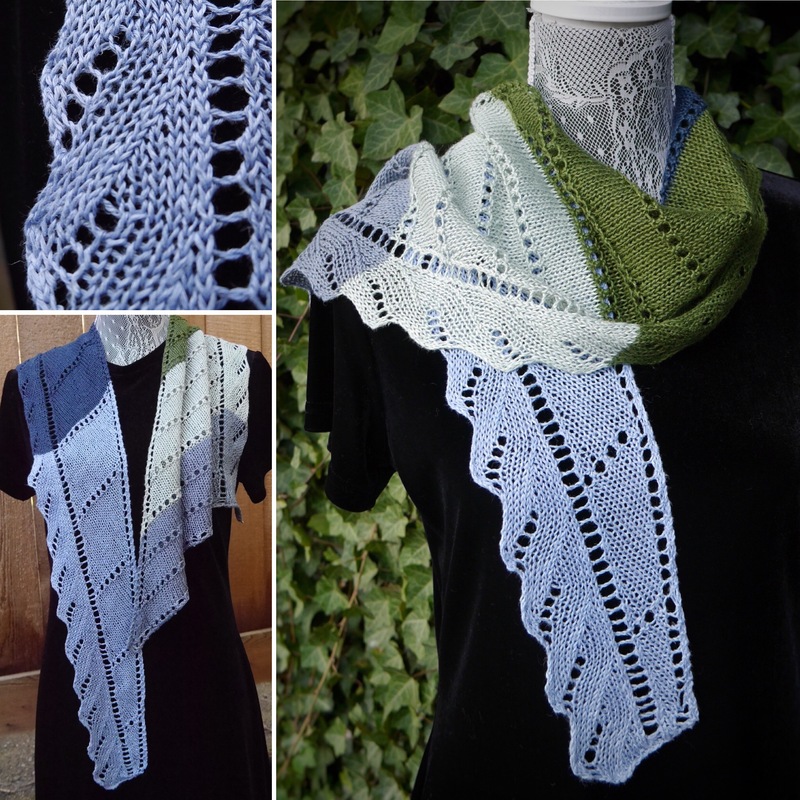 Like its sister SeaScape Scarflette, this is a long narrow asymmetric triangle. This one features a lacy edge of tumbling leaves. Linen gives this fabric a lovely hand and sheen. I highly recommend it! I used a Euroflax mini-skein set in the Forest colorway from Mason-Dixon Knitting. 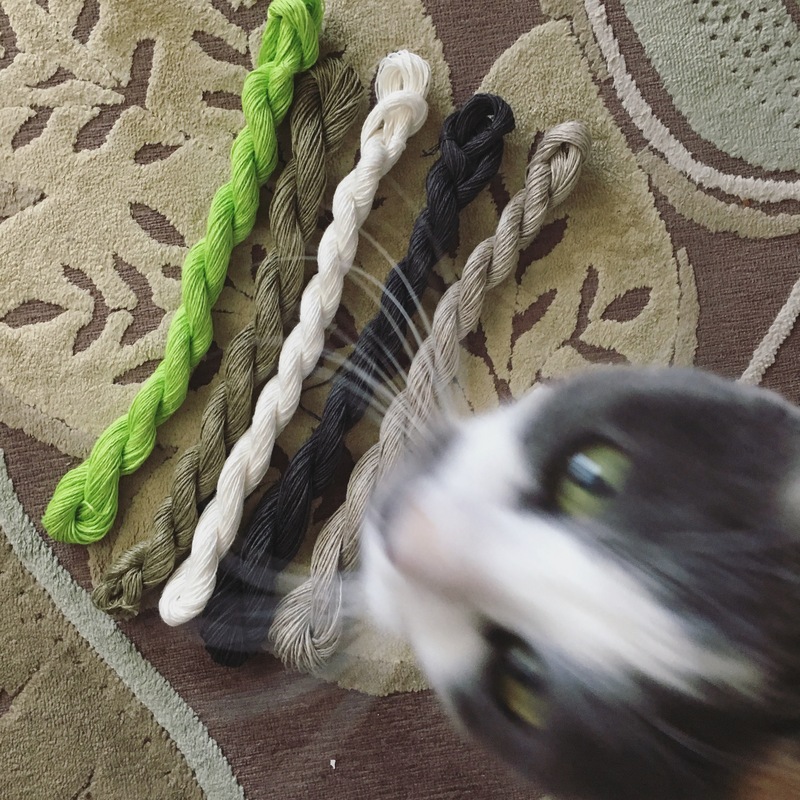 The mini-skein sets are back in stock, and new color sets have been added too. Just in time for a quick summer knit! The mini-skein set has 325 yards. A single skein of Euroflax Sport, which is 270 yards, will also make a nicely sized scarf. (I used about 300 yards of the minis, due to placement of color joins.) Test knitters Ann Berg and Rachel Nichols used Juniper Moon Farm ZOOEY DK, a 60/40 Cotton/Linen blend, 284 yards. It also blocked beautifully. The linen is slightly crisper, and a bit more open. 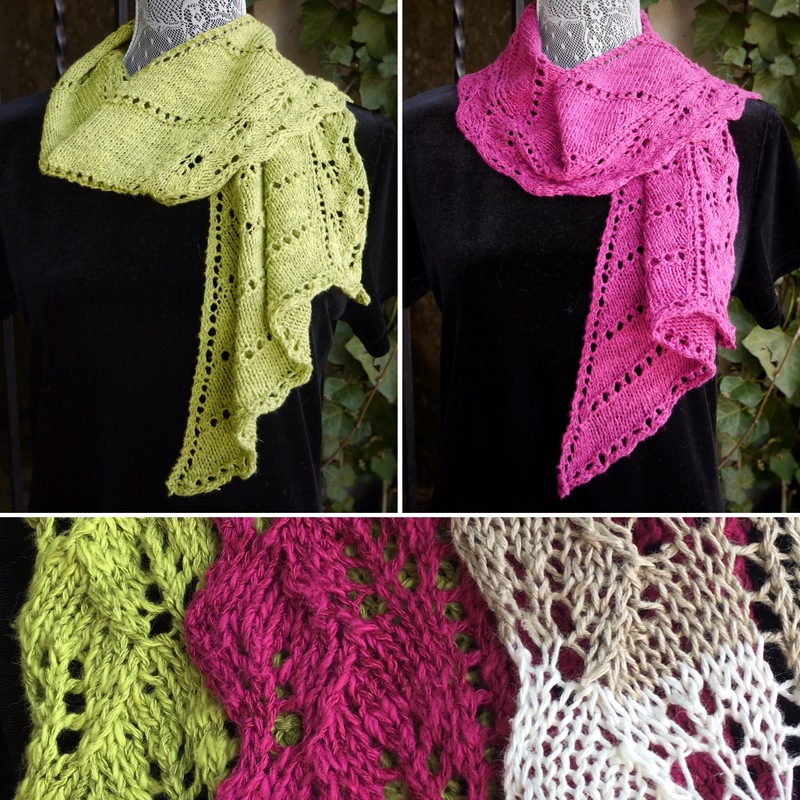 This pattern is available through Ravelry; Linden Leaf pattern page here. 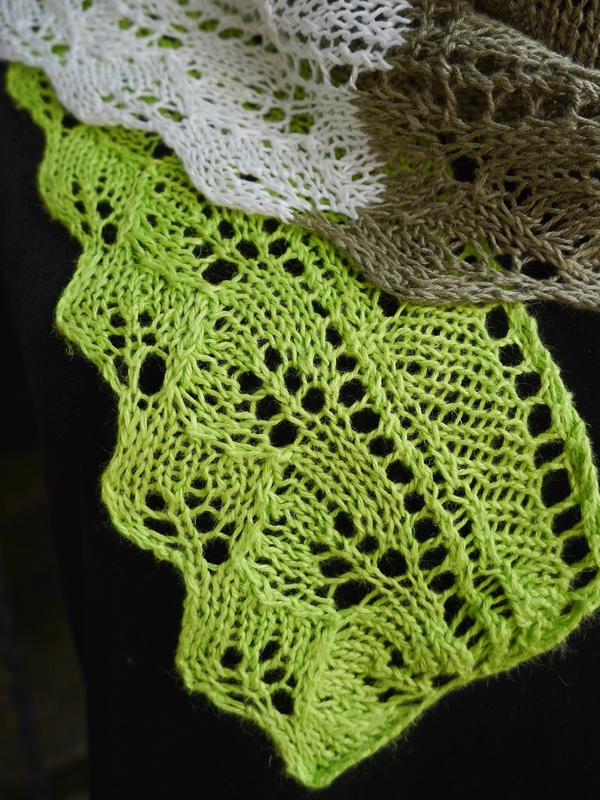 Linden Leaf is a sister pattern to my SeaScape Scarflette. The construction is the same; the difference is in the edging. Leaves or waves? Do you love both? I’m offering special combination pricing: 20% off for SeaScape/Linden Leaf bundle with coupon code BUNDLE. If you’ve already purchased SeaScape, the appropriate discount will be applied so your net price will reflect the proper amount.